Some images come easy, some not so. The featured image is one I have wanted to take since last summer but things just kept working against me. Salterstown Pier is only a 20 minute drive from my home in Co. Louth, Ireland. I have shot it many times and in many different types of light and weather. The area is a particularly well know Irish seascape location, popular with most landscape photographers in Ireland. The pier gives a strong foreground interest while the Cooley mountains form a beautiful backdrop. In the summer month’s it is not unusual to bump into other photographers in search of a beautiful sunset. Last year, the local council decided that health and safety called for a set of iron railings to be added to the pier. When I first saw them, I was horrified, thinking that one of my favourite locations had just been ruined. Then I started to see it in a different manner. It wasn’t ruined, it was just different and as such would require a different approach. I knew what I wanted from it. 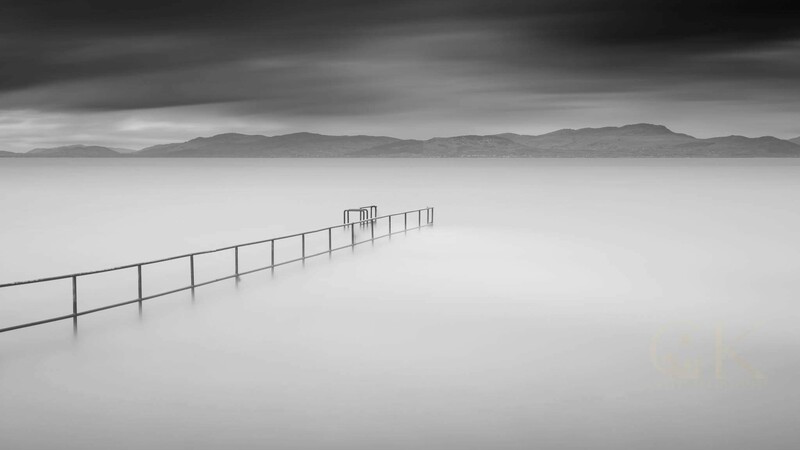 A long exposure black & white image with the railings running down into the sea complimented by the mountains in the background. Visualisation was the easy part, creating it turned out to be a much more difficult affair. Well firstly the tide passes this location deceptively quickly. 20 minutes is the difference between not being able to see the railings and being able to see too much of them. Timing needs to be perfect. I had visited on several occasions and not had the tides right. On the occasions the tides were correct, the sky was bland or patchy which wouldn’t suit the image I had in mind. Finally the day arrived when I reached the location with everything in the right place – dark brooding clouds and a high tide. At first, I could not see the railings, so it was simply a matter of waiting until the perfect moment. I then met m next complication – the wind was quite strong forming waves and rolling water. Not usually an issue but to keep the mountains in the background I could only shoot it from the right hand side and at a height to keep my composition as I wanted. There are large rocky outcrops to the right of the pier. The waves were hitting them hard and made a very difficult task of balancing both myself and a tripod on them as the larger waves washed in around them. I waited, composed and shot. 5 minutes per image. Finding a proper composition, setting up, taking some test shots, etc all took time. In the end, I only managed two long exposure images before the water had dropped too much. I am delighted with the image. I know I am the first to get it in this manner. It features in my upcoming mini exhibition at Listoke Art Gallery where I will showcase a small selection of my favourite long exposure images in one of the smaller rooms off the main gallery. Love the shot and appreciating your patience in getting the shot – which is excellent.